BENTONVILLE, Ark., Aug. 29, 2012 – In the past month, gas prices have gone up more than 25 cents increasing strain on consumers’ budgets and worries as fall and winter holidays approach. Walmart is easing the pain at the pump with the return of its Great Gas Rollback program, helping customers save on their fuel purchases in three different ways. Walmart customers using a Walmart gift card will receive a 10 cent per gallon discount. Customers who use a Walmart MoneyCard® or Walmart credit card will save 15 cents per gallon on their fuel purchase. 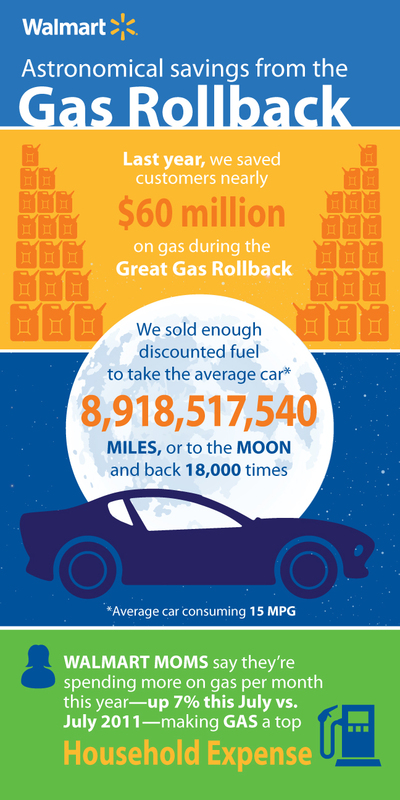 The Great Gas Rollback will begin Aug. 31 and end Dec. 24. Gas will be discounted at more than 1,000 Murphy USA and Walmart gas stations located at Walmart Supercenters in participating states. For more information on the program and a list of participating Walmart and Murphy USA stations visit www.walmart.com/gas. *Editor’s Note: The Great Gas Rollback differs slightly in Florida and Alabama due to state regulations. Visit www.walmart.com/gas for additional details.